When it comes to the cost of plastic surgery, liposuction particularly, it may feel like you’re running in circles and it’s sucking the life out of you (pun intended). At Austin-Weston, it’s our mission to provide patients with straightforward answers, so, in this article we are going to uncover the variables that go into the price tag for liposuction. The cost of liposuction varies per person because it is tailored to meet an individual’s needs and desired results. Some patients may have a small problem area that can be addressed in as little as an hour of surgery. Others may be doing almost the entire body and the procedure can take hours. Because of this variability, liposuction can cost anywhere between $4,000 and $20,000. The more areas a patient chooses to have addressed at one time, the longer the procedure will take. An example of this is a patient having abdomen, flanks, and arms addressed at the same time. The surgeon’s fee per area of liposuction is typically around $4,000 per area, with the first area being full price, and each subsequent area being half price. So, in this specific case, liposuction of the abdomen would cost $4,000, and the flanks and arms would cost $2,000 each. The total surgeon’s fee would run $8,000, and then anesthesia fees would be billed per hour of time in the operating room. Surgery is usually billed by how long the patient will be in the operating room, so a one-hour case is less expensive than a five-hour case. Typically, larger areas such as an entire abdomen or back will cost more than a smaller area like the inner thighs because larger areas take longer to treat. Costs can also be influenced by how technical the procedure is. If fine detailing is required, such as in the face or neck, the procedure can take longer and be more expensive. In general, treating multiple areas of the body at the same time is overall cheaper than if all those individual areas were broken up into separate sessions. Larger patients with more fat deposits may need to have a longer procedure to adequately remove the extra fat and achieve a smooth contour. Interestingly, very thin patients with only a small area to address can also take longer because of the finer instrumentation required to achieve a smooth contour. The principle of liposuction is that the fat left behind is as important as the fat removed. The ideal result is smooth, not just de-bulked of fat. 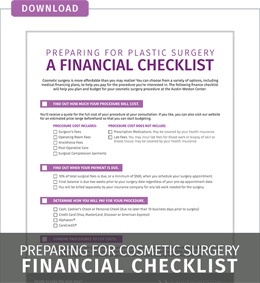 Advanced methods, such as ultrasound or laser-assisted liposuction, typically cost more than traditional procedures. These adjunct procedures during liposuction are usually selected by the surgeon to either break up stubborn fat deposits or to achieve some subtle skin tightening at the time of liposuction. Be sure to ask your surgeon at the time of consultation whether you might be a good candidate for an adjunctive liposuction technique. A highly experienced board-certified plastic surgeon may charge more than a less knowledgeable or respected doctor, but that isn’t necessarily true. There are some novice surgeons who seek out wealthy clientele using aggressive marketing, but after reviewing that doctor’s credentials, they may not be whom they claim regarding experience, board certification, or skill. All surgeons have their own approach to performing liposuction procedures as each doctor has different amenities at their disposal and different levels of experience and accreditation. The cost of anesthesia for liposuction can vary significantly for each patient. You want to make sure anesthesia is provided by a board-certified anesthesiologist or a board-certified CRNA (nurse anesthetist). If a surgeon uses a non-certified anesthetist nurse or a medical assistant to push the anesthetic drugs (and yes, unfortunately, this does happen), then your safety may be at risk. The Austin-Weston Center for Cosmetic Surgery includes five fully equipped surgical suites. These operating rooms are fully accredited by the Accreditation Association for Ambulatory Health Care (AAAHC), an association that certifies outpatient surgery centers. Our surgeons are board certified in plastic surgery and are fully insured, our Certified Nurse Anesthetists (CRNAs) are nationally certified by the Council on Certification of Nurse Anesthetists and all personnel is licensed and certified in Advanced Cardiac Life Support (ACLS). lculating the cost of surgeon's fees, anesthesia, surgical facility fees and all other expenses, total fees for liposuction can reach between $4,000 and $20,000. Many people don’t have this amount of money at their immediate disposal, but when the decision is made that it’s the right time to undergo the procedure, it becomes necessary to consider financing options. Practices almost always accept credit cards, but patients should carefully consider the associated interest rates of all available options. Also, there are several third-party financing companies that deal exclusively with those who want or need treatments that are not covered by insurance. At Austin-Weston, our board-certified plastic surgeons are committed to providing patients with the results they desire and the care and safety they deserve. To find out more about your plastic surgery options, please call (703) 854-9841 to schedule a free consultation.